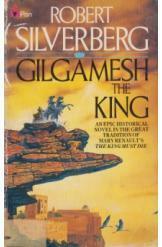 Gilgamesh the King by Robert Silverberg, Sci Fi. Book is in good condition, all pages intact. A modern novelization of the ancient Mesopotamian Epic of Gilgamesh. Gilgamesh, half god and a giant among men, reclaims the throne of Uruk and defies the gods in pursuit of immortality.